Remember back on January the 1st I couldn’t decide what to do about the infernal half a stone I’d been trying to lose for 6 months? My options were forget about it, do something drastic to lose it – or walk round dressed like Nicki Minaj so no-one noticed it. Well, as much as that last one appealed, I decided I wasn’t quite ready to give up yet so I thought I’d try the drastic option first. January the 9th therefore saw me wandering wide eyed (and wide hipped) into the underground gym of Educogym Harley Street Today, January 23rd I weigh 9lb less, I’ve dropped three percent body fat, virtually no muscle, and my stomach is pencil skirt flat (as it would be considering it’s 5cm smaller). If you want the Cliffnotes version, stop now – Educogym works, but if you want the details, read on. After all, in my case, it wasn’t exactly no pain for the gain. Let’s start at the beginning – my reason for choosing Educogym was simple. Laziness. They claim that their 12 days intensive program can see you drop around half a stone in that time – and you would do it doing just 15-20 minutes of exercise a day. Excellent – potentially massive results with minimum time. It was only once I was sat in front of them that they mentioned the word ‘nutrition’. By this point however I had seen full length photos of myself in a gym kit – from all angles (something you won’t be doing). If they’d said ‘you’re going to survive on donkey dung for 12 days, I’d have said ‘lead me to the mule’ – thankfully, it wasn’t (quite) that bad. In fact, at first glance the diet actually didn’t sound too bad. My shopping list included things like full fat cream cheese, smoked salmon, streaky bacon, macadamia nuts – and double cream to put in my tea. Things I haven’t consumed either at all, or without guilt for about 20 years! Shopping that evening I skipped round Sainsburys like the proverbial child in a sweetshop. The principle behind this is simple – of the three macronutrients you can consume fat produces the lowest rise in the fat storing hormone insulin. Protein is next lowest, carbs trigger the greatest rise (exactly how much depending on their GI rating). All low carb or low GI diets aim to reduce and/or balance insulin levels in the body which triggers fat burning. The Educogym diet however focuses heavily on fat as the idea is not just to merely reduce insulin but flatline it. This gives your body no option but to draw on your own fat stores for fuel. You combine the diet with a very specific strength training workout that aims to preserve the muscle mass you would normally lose shedding weight so quickly – one day legs, one day chest and back, one day shoulder and arms – and an abs routine you do daily. You lift the heaviest weight you can (with good form) at a rapid rate for just a few reps – there’s no resting between sets and no resting between moves. You are literally in and out within 15 minutes – but it’s a seriously tough 15 minutes. The gym – yes, it really is that empty most of the time. Now I admit, I am not the first journalist to try Educogym. Lots of them have done it, but what was going to be different about me was that I wasn’t going to do it in their gym. 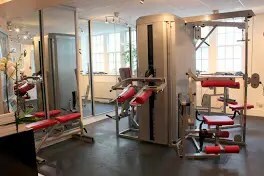 Because it’s a three hour round trip for me to go into London, it wasn’t massively feasible for me go to Harley Street daily to do my 15 minute workout – so, I was going to be their first take-home client. This turned out not to be something I’m going to recommend to anyone, but, we’re getting ahead of ourselves. First let me tell you what this would mean to me…. If you’re doing the monitored program you workout on the special gizmo above and the number of people in the gym is strictly limited. I was at my normal gym. To be able to jump from machine to machine fast, I was going to need to go to the gym at the quietest time of day – 3pm, which meant putting the gym ahead of any other commitment in my day (including work). I was going to have to work harder than I probably wanted to push myself – I needed to be at breaking point by the sixth rep of each set. This is tough to do on your own – especially if, like me, you have zero upper body strength. I could not go out socially – the diet is very carefully measured and because my exercise wasn’t being monitored my trainer Jagir wanted me to focus on getting the nutrition precisely right to counteract any shortfall from my not working hard enough during my workouts. I had to cancel my whole social life and all work meetings (which in my world normally involve wine or cake) for 12 days. Going into the plan, these were what I thought would be my hurdles. Turns out I was wrong – very, very wrong. My mind was in the right place to workout so fitting the exercise in and pushing myself was simple, and, it turned out social exile also wasn’t an issue. The issue was the diet…..but, because this post is already super long, I’ll tell you all about that tomorrow. Warning, it gets whiney – and there’s a tiny bit of vomiting!